Since his death over twenty years ago Tupac Shakur has become something of a prophet in his legacy; a deity of the rap world in which the mythology only continues to grow-building a perception and persona of a man who held some secret as to how our society operated and why when, and this is the most valuable thing the new biopic All Eyez on Me offers, it seems the alarmingly young Shakur was still very much trying to figure out who he was never mind the bigger questions the culture he was raised in implied for his future and the future state of our world. All of that to say director Benny Boom (Next Day Air) and his team of three rather novice screenwriters had a lot to overcome in order to deliver a final product that was not only satisfying, but relevant in terms of adding something substantial to the conversation around the life and times of Shakur. There has been a barrage of material released since the artist's untimely death in September of 1996, but All Eyez on Me would mark the first narrative feature and arguably the one with the best odds of reaching the widest audience. With this weight and presumed pressure of responsibility on his shoulders Boom has delivered what is more or less a by the numbers biopic for what was very clearly an individual who couldn't have operated by the numbers if he wanted to. Shakur was a man who seemingly had a constant conflict of conscience going on within him-attempting to balance the obligation he felt he had as an orator for the black community while simultaneously looking to solve such societal issues in the moment which often times resulted in compulsive acts of violence and/or spouting things from his mouth that he didn't consider before saying them in front of a rolling camera. 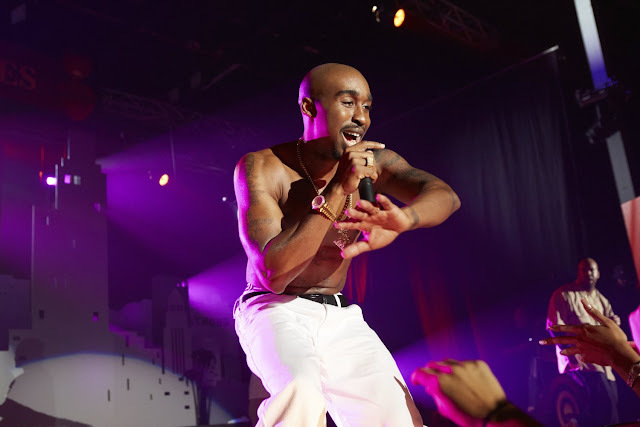 And while All Eyez on Me and its look-alike lead in newcomer Demetrius Shipp Jr. does in fact attempt to delve into this clash of consciousness Shakur constantly dealt with it's never able to transcend the tropes of the music biography enough to allow the audience to understand what cultivated and motivated these feelings. Sure, we see flashbacks galore and are privy to relationships in Shakur's life many might not be aware of that inherently give new light to this persona that has been crafted by the media and his constituent's since his death, but none of it to such an extent we feel we're inside the mind of Tupac thus restricting us from feeling like we've seen the real story of the man's life. 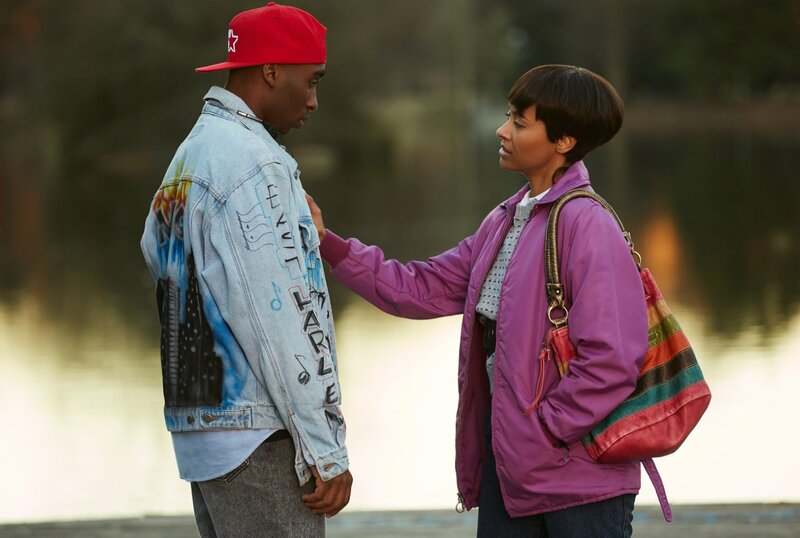 Tupac Shakur (Demetrius Shipp Jr.) and Jada Pinkett (Kat Graham) bond long before they both hit it big. Biographies are a tough nut to crack though, and even more so when many of the factors of your subject's life are rather well-known. In the case of Shakur many of his fans who will flock to this movie know very well the main beats of his upbringing-his mother, Afeni (Danai Guira), was a Black Panther who served prison time while pregnant with her son and served as her own lawyer during her trial and won. Many know Shakur went to a performing arts high school in Baltimore where he met Jada Pinkett (Kat Graham) though I wasn't aware of how close of friends the two were or the feelings Shakur apparently had for the young actress. Most will have fun being reminded that Shakur actually got his start in the rap game thanks to Shock G (Chris Clarke) and Digital Underground, that Shakur actually broke out as an actor in 1992's Juice before getting signed by Interscope records. Of course, while there are many accomplishments Boom recounts in his film there are plenty of things that aren't so glamorous and interestingly enough, Boom uses one such aspect-Shakur's incarceration for a sexual assault charge-as a framing device of sorts. We initially meet Shakur in 1995 where an unnamed journalist (Hill Harper) sets up the retrospective he is about to take Shakur (and the audience) through. We get the obligatory flashbacks and the stories that came before the fame and we of course get a glimpse inside the inner-workings of Shakur's life once he did become a force to be reckoned with, but one thing All Eyez on Me never seems to do is show us how much of an actual impact the rapper is having on society. Sure, we see the old news clips of civil rights activist C. Delores Tucker uttering her immortal observation: "There are three things wrong with gangster rap: It is obscene, It is obscene, It is obscene," but we never get a sense of Shakur's ever-evolving relationship with the community he sincerely believed he was an ambassador for. While Shakur was obviously very much a speaker for those who might not have had much of a voice prior and infused many of his songs with poetic qualities while offering his philosophy and critiques of unjust society we don't see how this relationship would come to position Shakur on the pedestal he now sits atop of. Furthermore, the criminal sin of All Eyez on Me is not that it lacks in fleshing out the relationship between Shakur and the public or even that it fails to dig deeper into the crucial relationship between Guira's Afeni and her son, but rather it is the lack of any development around Shakur and his love of the music he was creating that strikes the most startling note. It should be said that All Eyez on Me is certainly not the first musical biopic to put the music on the backburner, but it seems especially offensive here given it was essentially Shakur's lifeline to how he wanted to shape his reputation as well as his legacy. Like other films of the same ilk much of the focus is paid to the public turmoil said celebrity famously experienced or is re-directed into a love story of some sort that, while crucial to the fabric of who this person was, doesn't always explain what gave them the creative insights and/or intuition to create whatever has made them worthy of now having a major motion picture made about their life. We saw this in last year's crushingly disappointing Hank Williams biopic, I Saw the Light. Of course, much of how factors influence or inspire artistic endeavors will vary from person to person and in such cases as something like Walk the Line the love story is critical to the arc that Johnny Cash's life took. If one wants to see how to properly balance as well as emphasize the role that music plays in the mind of a pioneer in the music industry as well as give a thorough account of that person's life please see the highly underrated and underseen Get On Up and/or Love & Mercy as both are truly exemplary. In terms of hip-hop biopics though, the bar has been set rather high as both with Notorious featuring Jamal Woolard as Biggie Smalls who reprises that role here in All Eyez on Me and of course 2015's spectacular Straight Outta Compton were engrossing portraits of not just the artists at the center of those respective film, but how they became who they were due to the time in history in which they found their fame. Both films were able to document both why music came to play such a critical role in the lives of their subjects as well as how that music effected the world and the response to that music that shaped the perception of who people thought these men were as opposed to who they actually were with that void giving the movies an "in" to a fascinating exploration of these psyches. Shakur's lyrics and determination to be as real with audiences as he could be represented more than what a scene of his mother visiting him in prison and seguing into "Dear Mama," ultimately conveys. It is this lack of insight that ultimately dooms All Eyez on Me to a cliff notes version of Shakur's life rather than a film that picks one of the many fascinating aspects about its subject and illuminates that aspect further. Tupac performs at an album release party in All Eyez on Me. That isn't to say everything about the film is a failure for, despite the aforementioned shortcomings and some rather shoddy production values and cheap editing techniques, there are things here and there that redeem the hope the film might turn in to something noteworthy. Of course, the big story going into the film was how much Shipp Jr. resembled the late Shakur and it's true-the guy likely couldn't look any more like the actual 2Pac if he tried, but was this inexperienced actor going to be able to capture the energy, the tenacity of the real Shakur? This was my biggest personal concern for the project as it seemed Boom and his producers, namely L.T. Hutton, had cast actors that certainly looked the part and were great for sizzle reels and trailers, but who might not necessarily be able to deliver on the legacy of the people they were taking on. The endorsement of Woolard was comforting, but we all knew his presence would be minimal here and that the weight of the picture would naturally fall on the shoulders of Shipp Jr. And so, how does he do? It was concerning early on in the film as it jumps from one decade to the next-establishing Shakur's younger years with younger actors and only giving Shipp Jr. a line here or there in order to transition to another flashback, but once the film settles into itself and finds its footing in the dynamics between Shakur and the women in his life the actor hits an ease that allows a similar charisma to come to light. The scenes detailing Shakur's early relationship with Pinkett as well as his serious relationship with Kidada Jones (Annie Ilonzeh), daughter of Quincy Jones, who would become his fiancée and partner at the time of his death in September of 1996, are scenes that hint at what might have been had Boom and his screenwriters chosen to investigate some of these lesser known aspects of the hard cord, thug life representative that, despite being pegged as a certain type of black man, was very much an individual who was still figuring things out as much as he was talking like he knew everything there was to know. Simply by watching interviews with the real Shakur one can pick up on the fact he was smart enough to know how he came off and how he presented himself while being conscience of the fact of why he wanted to portray himself in such a way, but while Shipp Jr. does an earnest job of bringing Shakur back to life (his body language in the performance pieces are spot-on even though he's lip-syncing over actual Pac tracks) the movie he is in fails him in the way it never finds a solid foundation on which to present a new picture of Tupac, but instead only rehashes every headline ever written about the rapper. 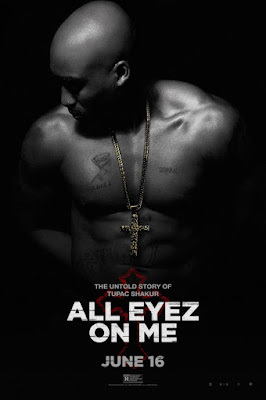 By no means a bad film, All Eyez on Me is instead a mostly competent, but uninspired one about a human being who was anything but.